In the winter, my crockpot is a permanent fixture on my kitchen countertop. Until last week, I hadn’t really used it much to make anything during the summertime, which is a crying shame considering how easy it was and that the summer is pretty much over. 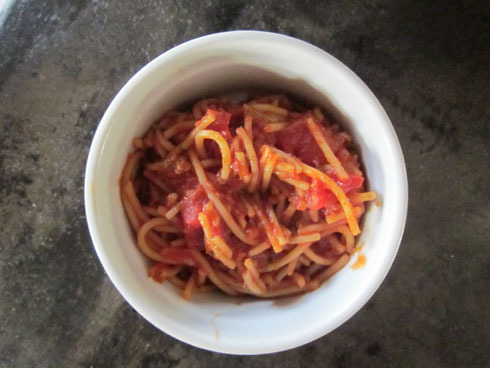 Facing a night where we may or may not have guests, I wouldn’t have much time to prepare dinner after work, and it was piping hot in the kitchen – I decided to give crockpot spaghetti a try. It was both delicious and simple to prepare; I’ll definitely make it again. 1. It is super easy to make and takes very little prep time. 2. Most of the ingredients are pantry items, so it is very easy to have everything on hand. 3. It is very healthy and low in calories, which is great for those times when you’re craving a hearty pasta but could do without the hefty calorie load. 4. It makes a big batch which means this is good for a crowd, or a meal with leftovers for later in the week, or to build up extra meals for your freezer. 5. MY KIDS ATE IT WITH GUSTO. For every meal until it was gone. In a pan over medium-high heat, brown the ground beef. Drain fat, and add to crockpot. Add diced tomatoes, 2 c. tomato juice, dried onion, Italian seasoning, and garlic salt. Cook on low heat for 6-8 hours. One hour before serving, heat remaining 3 c. of tomato juice in microwave for 5 minutes (cover unless you want to risk a fully spattered microwave), then add to crockpot. Break spaghetti in half and add to crockpot, stirring until everything is well combined. Turn crockpot to high, and cook for one hour. Stir and serve.